In the 19th century the area was part of Rancho San Rafael. Mount Washington was founded in 1909 as a subdivision laid out by real estate developer Robert Marsh. Marsh built the Mount Washington Hotel at the summit of Mount Washington, and the Los Angeles and Mount Washington Railway Company was soon established as a funicular railway up the hill as an alternative to constructing roads up the area's steep hillsides. The railway operated until January 1919. The district is generally considered the most affluent area of the East Side, and also contains the region's largest concentration of non-Latino whites (though not as affluent as the neighboring cities of South Pasadena, San Marino, and southwest Pasadena; for instance, 30% of census tract 1851 (Mount Washington) has incomes of $100,000 or greater; while 35% of census tract 4806 (South Pasadena) has incomes of $100,000 or greater). The "beauty and the quirky nature of Mount Washington" has inspired songs. The 2000 U.S. census counted 12,728 residents in the 1.85-square-mile Mount Washington neighborhood—or 6,878 people per square mile, an average population density for the city. In 2008, the city estimated that the resident population had increased to 13,531. In 2008 the median age for residents was 33, about average for the city and the county. The percentage of never-married men (40.9%) was among the county's highest. According to the Mapping L.A. project of the Los Angeles Times, based on the 2000 census, the neighborhood was "moderately diverse" ethnically, with a high percentage of Latino residents. The breakdown was Latinos, 61.2%; whites, 20.8%; Asians, 12.8% ; blacks, 2.6%; and others, 2.7%. Mexico (44.4%) and El Salvador (9.6%) were the most common places of birth for the 41.5% of the residents who were born abroad—an average figure for Los Angeles. The 2000 census found that the median yearly household income in 2008 dollars was $57,725, about average for the city. The average household size of 2.9 people was about the same as Los Angeles as a whole. Renters occupied 45.1% of the housing stock and house- or apartment-owners held 54.9%. Mount Washington (tract 1851) has a median household income of about $60,000; and 30% of its residents have a household income greater than $100,000 per year; neighboring census tracts shared with Mount Washington and other neighborhoods also have somewhat similar income data. According to the Mapping L.A. project, Mount Washington is bordered on the north by Eagle Rock, on the east by Highland Park, on the south, southwest and west by Cypress Park and on the northwest by Glassell Park. Mount Washington is split between Los Angeles City Council districts 1 and 14 and is part of California's 31st congressional district. The neighborhood lies mostly within ZIP code 90065, with an eastern portion in 90042, and the area code is 323. Twenty-five percent of Mount Washington residents aged 25 and older had earned a four-year degree by 2000, an average figure for both the city and the county. One school lies within the neighborhood — Mount Washington Elementary School, LAUSD, at 3981 San Rafael Avenue. Mount Washington students "consistently score among the top schools in Los Angeles on the Academic Performance Index." Owing to its hilly geography, Mount Washington lacks major arterial streets. However, nearby transportation options allow easy access to Downtown Los Angeles, Pasadena, and other areas of Los Angeles. Several major thoroughfares run through adjacent neighborhoods, including Figueroa Street, San Fernando Road, York Boulevard, and Eagle Rock Boulevard. 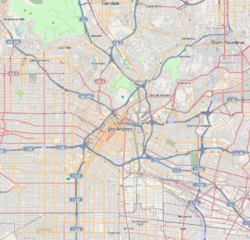 The area is also served by several freeways: the Pasadena Freeway, Glendale Freeway, and Golden State Freeway. The Metro Gold Line serves southeastern parts of the neighborhood with a station near the Southwest Museum. ^ a b "Mapping L.A." The Los Angeles Times. Retrieved 2010-05-27. ^ a b c d "N.Y. Times, Mapping America: Every City, Every Block". The New York Times. 2010-12-13. Retrieved 2010-12-17. ^ "A Mount Washington Love Song". Eastsider. Retrieved 2010-12-17. ^ "Mount Washington Elementary PTA"
^ "Getting the Slant on L.A.'s Steepest Street"
^ "The Real Top 10 List of Steepest Streets in San Francisco". 7x7. 2016-02-11. Retrieved 2016-04-15. ^ Layne Murphy, "Jack Smith - Mount Washington Favorite Son" Archived 2015-12-08 at the Wayback Machine, Mount Washington Homeowners Alliance, Retrieved December 4, 2015. Wikimedia Commons has media related to Mount Washington, Los Angeles.